Welcome to the 3rd part of this 5-part series where we’ll cover best-practices and practical tips & tricks for developing, deploying, and managing a web application with an eye for application performance and operational efficiency using AWS CloudFormation and Elastic Beanstalk. 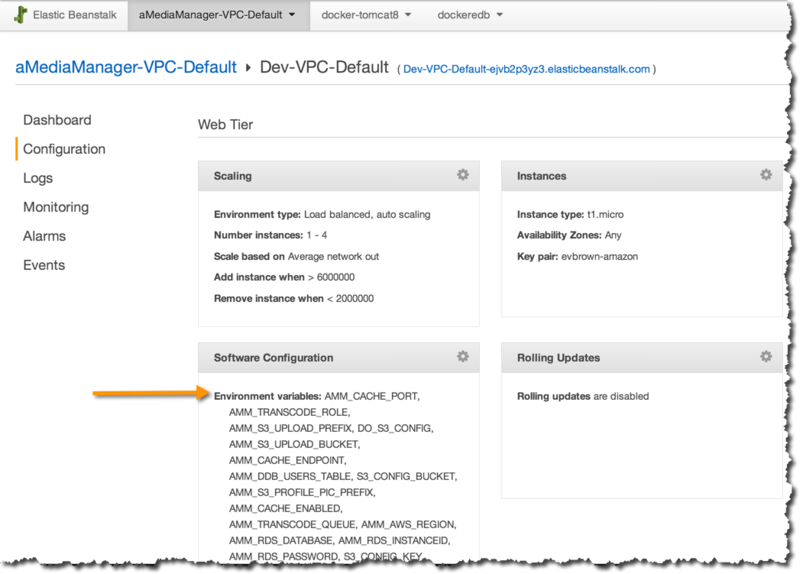 Last week (blog post and Office Hours video) we looked at building a VPC with CloudFormation and deploying the aMediaManager application into it. How to build an app that works equally well in us-east-1 and ap-southeast-2? We’ll be discussing this blog post – including your Q&A – during a live Office Hours Hangout at 9a Pacific on Thursday, April 24, 2014. Sign up at https://plus.google.com/events/ceoe036ugsu6hndr6ncl616gr3k. If this is the first post you’ve read in the series, be sure to check out Part 1 or Part 2 for more info on the app, including basic functionality and how to deploy it yourself. 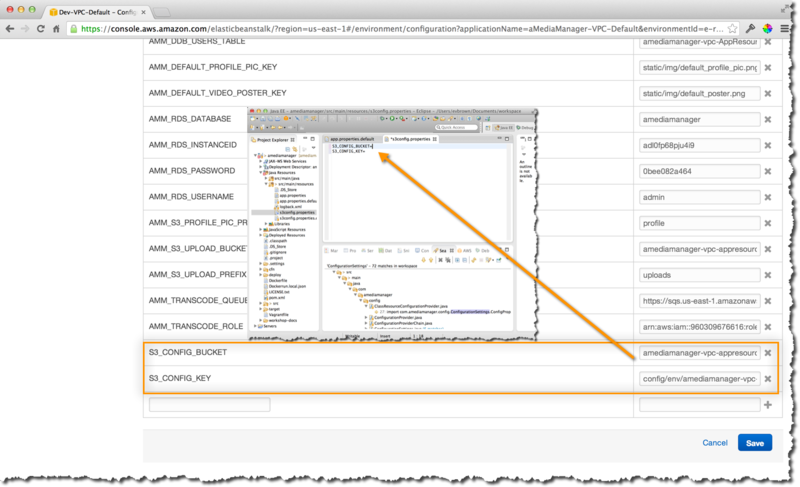 Our aMediaManager application has a lot of configuration data it needs to know about: RDS database connection info, DynamoDB table names, S3 bucket names, ElastiCache connection info, SQS and SNS names, etc. We handle config in a very straightforward way: a key=value-style property file and a simple config class that exposes the values to our app. We wanted configuration for this application to be really simple and flexible. It should be possible to create a config file and use it in local dev, but it should also be possible to store the config file in S3 and point our application to its remote location and load it from there. com.amediamanager.config.ClassResourceConfigurationProvider – This will load a local file using getClass().getResourceAsStream(someFileName.properties) to be used for configuration. com.amediamanager.config.S3EnvConfigurationProvider – This implementation will load the application configuration file from S3. It expects the S3 bucket and object key that point to the file to be available as OS env vars named S3_CONFIG_BUCKET and S3_CONFIG_KEY, respectively. The implementation extends com.amediamanager.config.S3ConfigurationProvider which provides the basic S3 implementation. We also want to make it simle to mix and match the configuration provider/implementation that you use. 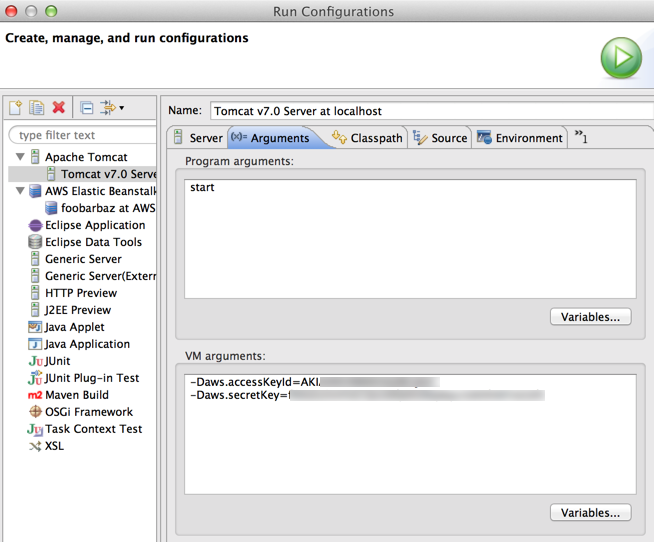 I like to use the ClassResourceConfigurationProvider when I’m developing locally in Eclipse, but when I deploy to Elastic Beanstalk I expect the configuration file to live in S3 and use environment variables to tell that application where to look (and thus expect it to use S3EnvConfigurationProvider to find its config). To help mix and match providers we built com.amediamanager.config.ConfigurationProviderChain, which allows us to chain together multiple com.amediamanager.config.ConfigurationProviders. Finally, we have a utility class – com.amediamanager.config.ConfigurationSettings – that chooses the correct ConfigurationProvider from the chain and lets us actually read (or update) a configuration value. Looking at the source we can see how we defined the ConfigurationProviderChain in the ConfigurationSettings class to look for config in 3 different providers (i.e., S3EnvConfigurationProvider > S3FileConfigurationProvider > ClassResourceConfigurationProvider). Good news! 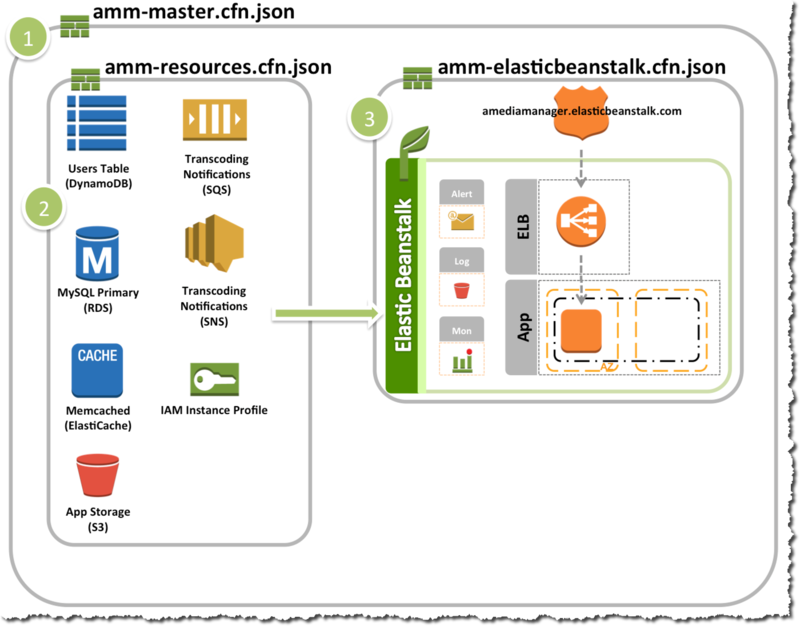 Although it can sometimes be necessary or convenient to manually create a big configuration file, we can use Elastic Beanstalk to automate the whole thing. Let’s see how. Each EC2 Instance that Elastic Beanstalk deploys our application to has all of these environment variables available to them. Now we want just one of those instances to aggregate the values into a file and upload to S3! deploy_config.py – This simple Python script we wrote looks for all of the AMM_ prefixed environment variables on the system, turns them into a key=value properties file, and uploads that file to S3. Note: There are a few other config files in the .ebextensions folder that you can browse on GitHub. After one of the Instances in our Elastic Beanstalk environment runs the deploy_config.py, a file with all of our app config will be stored in S3. At this point, CloudFormation has created our resources, deployed our Elastic Beanstalk environment, and that environment uploaded the configuration to S3. How does our Java app know how (or where) to load that config from? Remember earlier that we defined the S3EnvConfigurationProvider implementation that would look for S3_CONFIG_BUCKET and S3_CONFIG_KEY in the environment and load config from there. The application config stored in S3 is private by default. This means both our app in both local dev and deployed to Elastic Beanstalk will need AWS credentials with proper rights to access it. 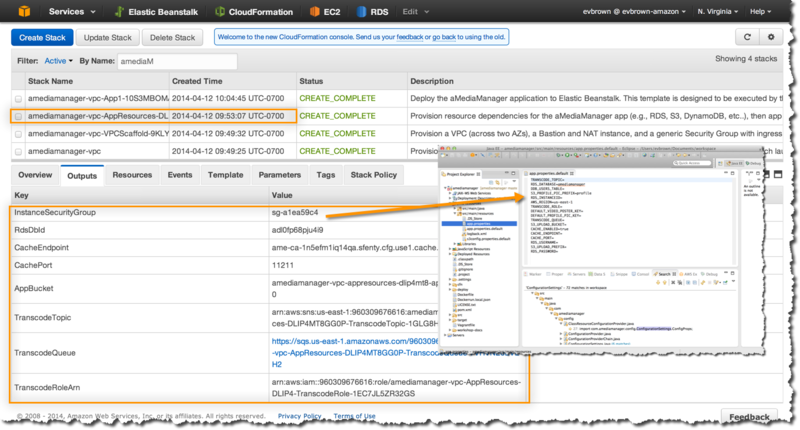 When you deploy the Elastic Beanstalk environment with CloudFormation, an IAM Role is created with the appropriate permissions and the application source automatically uses that IAM Role to make authenticated calls to access S3. Last week in Part 2 of this series we talked about patterns for building CloudFormation templates that work well in multiple regions. Since we’ve made it easy to deploy this app to any of 8 AWS Regions, we should be sure that our app code behaves well when using resources like DynamoDB tables and SQS queues in different regions. However, because we didn’t specify otherwise, the dynamoClient we created is pointing to the DynamoDB API endpoint in us-east–1. That’s great if we’re running in us-east–1, but what if we had deployed our application to the us-west–2 Region in Oregon (which means the DynamoDB table was also created in us-west–2 and doesn’t exist in us-east–1)? Well, it just wouldn’t work! First, don’t forget to join us for the live Office Hours Hangout later this week (or view the recording if it’s past April 24 2014 and you don’t have a time machine). 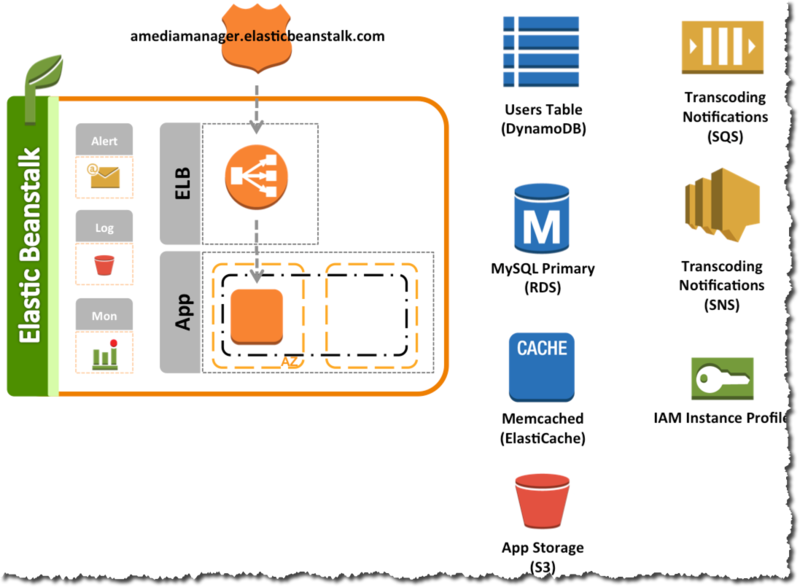 Next week in Part 4 of this series (blog post and Office Hours links forthcoming at http://blogs.aws.amazon.com/application-management) we’ll look at how we used Amazon S3 and Elastic Transcoder Service to scale video upload and conversion jobs for the aMediaManager application.